In the old days, that was the case. Back when Trollop and Jane Austen were writing, they had at least two chapters before readers gave up on them. Many of today’s literary writers have the luxury of several chapters before readers give up on them. But, most of us must capture our readers in the first sentence! There is so much that has to be done in that initial chapter. Action, yes. But also some explanation of action. They want to know why, but they don’t want a lot of exposition. Geez! Here’s the rub. When I’m writing my book, putting those words on paper for the first time, I don’t have a full idea of what the story is about. My creative process evolves as the story and the characters evolve. 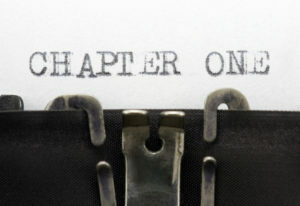 I may start out with a story idea but it could change completely before the final chapter is written. Usually I have a good idea of where the story is going once I’m about half-way through it. But, when I’m writing that first chapter, I’m as clueless as my readers. That means I must go back and re-work that first chapter over and over to capture the essence of the story and to hook the reader. The work involved in doing that is almost more strenuous than writing the 80,000+ novel. Opening Hook–That all-important first sentence that tantalizes your readers. The hook needs not only to create questions in the reader’s minds, but also give them an idea of who is talking. Who is telling this story? Starting the story in the middle of something. No story starts at the very beginning. If we are in the middle of something, then the reader wonders what went before and what went after. A clue about setting. Some excellent writers begin with setting. Most of us need to simply sprinkle a little locale information in the first few pages to let the reader know where they are and in what time period. If you’re writing in the 19 Century, you can’t wait until Chapter 2 for the readers to find this out. An inciting incident. This is the event or incident that starts the story rolling. What happened (in the middle of wherever you are) that incites the story? The main character’s intentions and goals and dreams. We can’t go into a lot of backstory in the beginning. So, when we talk about intentions, we need to understand what the character plans to do (as a result of the inciting incident) and give small hints about why they are doing it (deeper desires). We don’t tell all here. If we do, why go on reading? An element of mystery. Even if you’re not writing a mystery, you need to have something going on that keeps the reader reading. The element of mystery, not knowing all the answers to something, is what creates mystery. All of these elements must be accomplished in the first chapter in a way that keeps our readers turning pages. We can’t give away too much information and yet we must share just enough. The crucial questions that all writers ask are how much is too much and how much is enough? What are your experiences? How do you manage to tweak and perfect those first few sentences in order to hook your reader? Take a peek at e-Murderer. 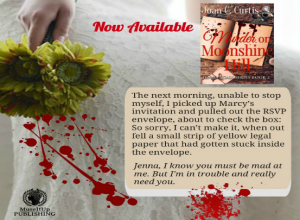 Book 1 in the Jenna Scali mystery series.